People watch a TV screen showing North Korean leader Kim Jong Un's New Year's speech, at Seoul Railway Station in Seoul, South Korea, Jan. 3, 2018. North and South Korea agreed Friday to revive their formal dialogue. North Korea has accepted South Korea’s offer of high-level talks next Tuesday, Jan. 9, at the truce village of Panmunjom in the heavily fortified demilitarized zone dividing the two Koreas. According to South Korea’s Unification Ministry, on Friday morning, North Korea sent a message saying it would accept Seoul’s offer to meet at the border village to discuss Olympic cooperation and how to improve overall ties. Ministry spokesman Baik Tae-hyun said it was expected the two Koreas will use a recently restored cross-border communication channel to determine who will head their respective delegations next week. Any dialogue between North and South is seen as a positive step in improving relation in Korean Peninsula, which would contribute to the overall stability in the region. 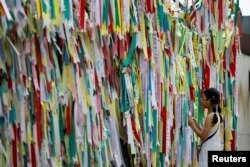 A girl looks at a barbed-wire fence decorated with ribbons bearing messages wishing for the unification between the two Koreas near the demilitarized zone separating the two Koreas in Paju, South Korea. 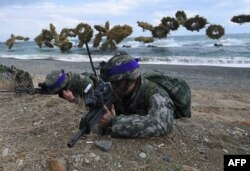 South Korean Marines take position on a beach as amphibious assault vehicles fire smoke shells during a joint landing drill by U.S. and South Korean Marines in the southeastern port of Pohang, April 2, 2017. The North’s announcement Friday came shortly after United States and South Korea decided to delay joint military exercises until after the Pyeongchang Winter Olympics next month. South Korea’s Blue House (executive office) said Thursday the decision came during a phone call between U.S. President Donald Trump and President Moon Jae-in. Isabela Cocoli contributed to this report.